Monkey Business User Guide: Setup DNS for domain names AJIBOYE Monkey Business Agency provides full DNS hosting, and management for your websites. Setup DNS for domain names Easy configuration options to setup the DNS for your domain names you want to use with your Monkey Business websites. AJIBOYE Monkey Business Agency provides easy DNS hosting and management. Your User Guide to Monkey Business from AJIBOYE Monkey Business Agency. Learn how to use Monkey Business Management System to build your business FAST. DNS means Domain Name Service. You can only setup DNS for domain names that you own, so buy it first. Your Domain Name Registrar is the company you bought your domain name from. Your DNS Manager is the tool provided by your Registrar to setup or modify DNS. If you bought your domain names from us, use Option 1 below to setup DNS. If you did not buy your domain name from us, use Option 2 or Option 3. Go to My Projects, and select Hosting & DNS. You will see all the domain names associated with the project on this screen. If the domain name is available for purchase, then you will see a link to buy it. If the domain name is NOT available for purchase, then you will see its current DNS servers. When do I need to setup DNS? It's easy. Simply try to go to your website using the domain name. If you cannot, then you need to setup your DNS. The recommended way to setup DNS for your domain names is by simply using our DNS servers, thereby delegating management of your DNS to us. You cannot setup DNS for domain names you do not own. 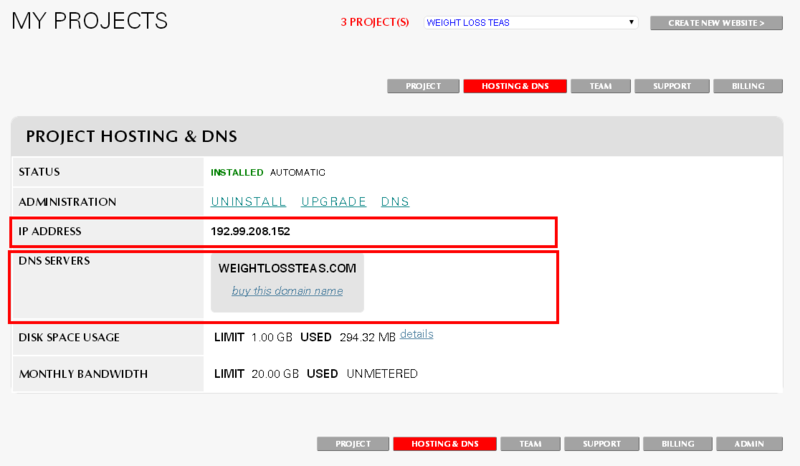 If you purchased your domain name from us, then use this option to quickly setup DNS. Go to My Projects, select DNS & Hosting, and use the DNS option. Once you do that, wait about 15 minutes for DNS changes to be updated globally, and you can start using the domain name. Log into your DNS Manager tool provided by your Registrar and simply change your DNS servers to ours ( listed above ). Once you do that, wait about an hour for DNS changes to be updated globally, and you can start using the domain name. First, locate your IP address for the project ( see screenshot above ) and create the following DNS records in your DNS manager. This is the minimum settings needed to make sure that website and email works properly.